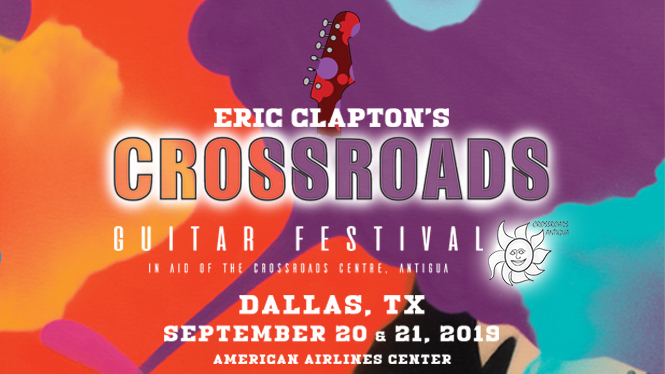 Eric Clapton will bring the fifth installment of the Crossroads Guitar Festival to American Airlines Center on Septemeber 20 & 21. Clapton will gather the past, present and future of guitar music onto one stage for an unparalleled musical event. All profits from the Festival will benefit The Crossroads Centre in Antigua, a treatment and education facility founded by Clapton for chemically dependent persons CURRENT CROSSROADS FESTIVAL ARTIST LISTING (Note: Two Different Nights of Music. Not All Artists Will Perform Both Nights but Eric Clapton Will Perform Both Nights.) Alan Darby, Albert Lee, Andy Fairweather Low, Billy Gibbons, Bonnie Raitty, Bradley Walker, Buddy Guy Band, Daniel Santiago, Derek Trucks, Doyle Bramhall II, Eric Clapton, Gary Clark Jr., Gustavo Santaolalla, James Bay, Jeff Beck, Jerry Douglas, Jimmie Vaughan, Joe Walsh, Jonny Lang, Keb Mo, Kurt Rosenwinkel, Los Lobos, Pedro Martins, Peter Frampton, Robert Cray, Robert Randolph, Sheryl Crow, Sonny Landreth, Susan Tedeschi, Tom Misch and Vince Gill.